Calipers are a valuable tool that many professionals and DIYers use to perform specific measuring tasks. The Starrett Dial Caliper is easy to read thanks to the glare-free, smooth-satin finish and white dial face. This ruler is also equipped with crisp lines that make reading the measurements easy. The jaws of the caliper’s claws have knife edges that will carve parallel lines on wood or metal. The depth rod is well-integrated into the caliper and is very easy and convenient to use. The durable, stainless-steel construction is long-lasting and corrosion-resistant. With proper care you’ll have these calipers for years to come. Gear accuracy will never be a problem due to the positive double-pinion, anti-backlash control. Users won’t have to worry about foreign substances clogging the gears because the teeth on the rack point downward rather than pointing upward or at a slant. You will get precise, accurate measurements for depth, internal, and external readings. There is a lock screw that will hold the sliding jaw in place and will lock the dial bezel as well. There are many professions that use calipers. 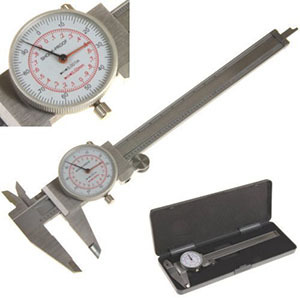 Most dial calipers are used for measuring size differences between two objects as well as measuring inside, outside, depth, and step measurements. They are one of three types of calipers available and all of them work in very similar ways. This Starrett Dial Caliper will be a great addition to your tool box and will give you the accuracy and reliability you are looking for. The Starrett dial calipers use simple movements and backlash gears to get the precise measurements users need. If you have any reason to take them apart (which is not recommended) use extreme caution because the parts can easily come loose and you may lose something you need for the calipers to work properly. Remember where everything goes as you take the the workings apart. Write it down if that helps. Sometimes trying to remember without writing it down proves to be inaccurate. The Starrett 1202 is a better-made caliper than many other standard-version calipers. They are sturdy and have a newly-designed movement that is a big improvement over the old calipers. There are many professions that use dial calipers. These include architecture, mechanical engineering, machining, carpentry, woodworking, metal working, manufacturing and even medicine. 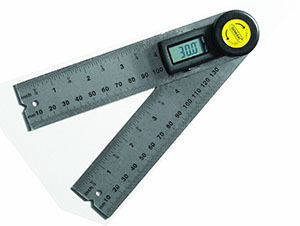 They are used when it is important to get a precise measurement. These are a reliable way to get these important measurements. Dial calipers are one of three types of calipers that users have to choose from. Many prefer dial calipers due to the fact that they work well, are not super hard to use and there are no batteries or charging activities to worry about. 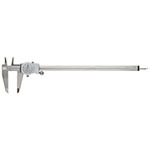 Whether you are in a profession that uses calipers on a daily basis, or you are simply working in your garage on projects that require you to take precise measurements of this type, the Starrett Dial Caliper is the way to go. Dial calipers are a more user-friendly type of caliper that uses a dial that allows the user to add the number showing on the dial to the number on the main scale. This gives the user the total measurement. The Vernier style of caliper relies only on the points along the scale to get the measurements which can be a bit inaccurate. The adjustable claw that a dial caliper uses, slides along the rules scale and will provide precise measurements of the internal and external diameters of an object along with the depth and step of that object as well. Most of the dials on dial-style calipers are large, which makes reading the measurements much easier than it can be on the vernier caliper. The dial caliper will read in metric and inches. The outside diameter is measured with the large jaws of the caliper. The inside dimensions are measured with the small jaws, depth is measured with the extending probe rod and the step measurements are taken by using the front of the dial caliper to provide the user with thorough measurements. 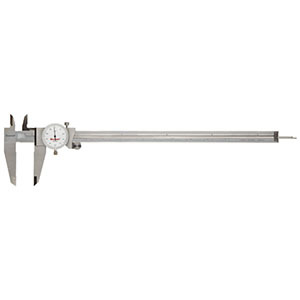 The Starrett Dial Calipers provide accuracy to plus or minus, one graduation per every 6”. These capabilities are consistent as long as the surfaces being measured have not been bent, damaged or worn in any way. Most dial calipers will be able to measure within a range of 0 to 6”. There are also 8”, 12” and longer calipers available as well if you need them. The longer calipers do tend to be much more awkward to handle than the 6” models. If you are measuring something that is over 4” you will have an easier time if you get an 8” caliper. We started our research by doing a general search for dial calipers and put together a list of the most desirable features for a top quality caliper. 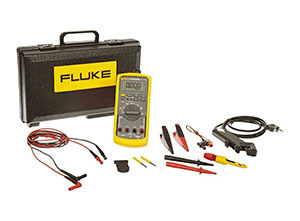 We compared ease of use, durability, measuring gauge, display ease and more. We also talked to industry experts and learned what made an excellent quality caliper in their opinion, since they use them on a regular basis. Lastly we looked at tool forums, blogs and magazines and checked Amazon reviews and comments from customers that have purchased and used calipers. Amazon gives the Starrett 1202-12 dial caliper a 4.1 out of 5-star rating from 11 reviews. One customer reports “This is the best price I could find on the Starrett calipers in the 12″ version. They last forever (if taken care of) and are the most accurate pair I have ever bought. Get these and you will never need to buy another pair. If you are in a profession that requires the use of a more professional grade dial caliper, you will want to get the Brown and Sharpe 599 Series Dial Caliper. These Swiss-made calipers will be an excellent addition to your tool box, especially if you are in a profession where using them is commonplace. 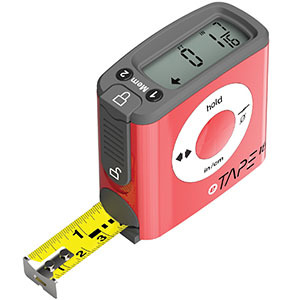 This caliper has a 1.25” rotating dial that can be locked into place. Construction is stainless steel which is super durable and long lasting. Measurement type is in inches. It has a covered rack that prevents errors because foreign substances and matter can’t get into the gear. Users can use these calipers for measuring internally, externally, depth and step as well for an all inclusive measurement that is precise and accurate. The adjustable zero allows users to set zero at a distance that is convenient for the user. The rod that measures depth is integrated into the rack. The extra hard stainless steel jaws provide users with a caliper that will last a long time. Spare parts for the Brown and Sharpe are readily available should you need them. You will have even more accuracy over the configurations of other standard gears because of the spring anti-backlash control. For those who are not familiar with backlash, it is the amount of clearance available between the mated gear teeth that are in the controls. This feature prevents the gear teeth from getting jammed. Taking care of your tools plays a part in how long they last and how well they continue to do their job. There are several things you csn do to ensure that your dial calipers last a long time. There’s no reason why, with the right care and maintenance that your dial caliper can’t last for years and years. We have provided some valuable tips below for users to use as a guideline to keep their calipers in great shape for a long time to come. When it comes to safety, calipers are not really dangerous tools to use or work with, so there is very little in the way of safety that is available. Follow basic safety guidelines when it comes to working on the job site or with the tools you are working around and use good common sense. The dial caliper should be kept out of reach of children, as they can break the internal jaws by playing with it. Tools are never toys, so even the ones that aren’t dangerous should be kept out of their reach. If you work in an area that rusting is a problem, lightly oil the exposed steel and then wipe it off with a cloth. When you first get the caliper, take a dry cloth and some wd40 and wipe off the exposed metal parts which are the beam and the jaws. Do not oil the plastic parts. Once oiled, take another dry cloth and wipe off all the wd40. Dial calipers are used every day in numerous applications by metal workers, architects, woodworkers, carpenters, machinists and many more. Finding a good quality caliper is important if you want to ensure that you are able to take excellent measurements that are accurate and reliable. The information in this review is designed to help you sort through the large selection of dial calipers on the market so you can choose the one that meets your needs the best. With the right information, it is much easier to narrow the field down and get rid of the models and designs you have no interest in. A well-designed dial caliper will last decades when it is taken care of well. Even if you end up spending more for it, it is worth it and you will have a tool you can rely on. One that will last through any workload. We’ve also provided maintenance tips for users so they know how to properly care for the caliper once they decide which one works the best for them and purchases it. This maintenance is not difficult and will ensure that the caliper remains in excellent working order. Choosing the right tool, even a smaller one like the dial caliper, is very important since you will be using it a lot. 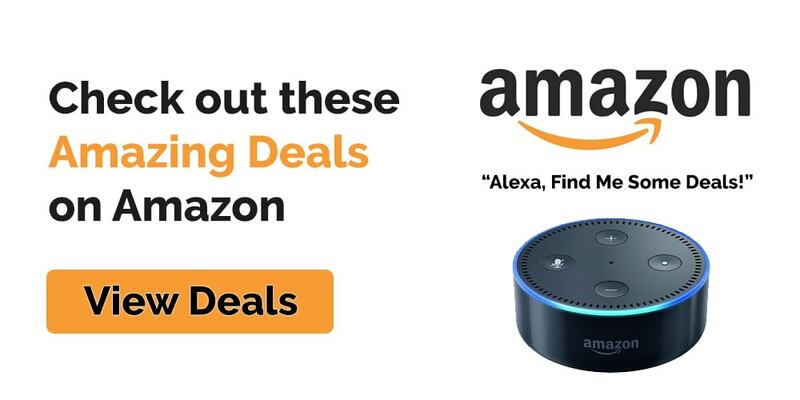 With the right attention to the features and qualities you need, you will be confident in the choice you make and will not have to worry that you have wasted your money.